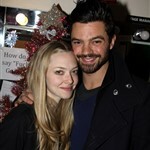 Remember when Dominic Cooper and Amanda Seyfried were a thing? No? Mamma Mia? "I got my heart broken pretty hard. I was just kind of foolishly thinking that the two of them were done and Dom and I were involved." Umm… how…ironic? Is that ironic? Joanna wrote the other day about Amanda Seyfried and Thomas Sadoski going social media official. Yesterday they were papped holding hands after voting, evidently more and more comfortable with being known publicly as a couple, because people will have, by now, forgotten about the timing. Or didn’t stop to care about the timing. This time.